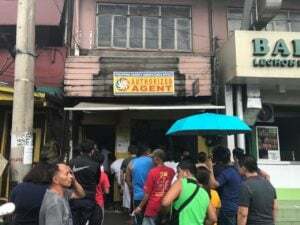 With the jackpot for the UltraLotto 6/58 expected to reach P1 billion by Tuesday, lotto outlets of the Philippine Charity Sweepstakes Office (PCSO) across the country have attracted long queues. Filipinos taking a chance to bet on the right number combination and hit the jackpot have one hope: a better life. Would any of these lotto hopefuls win the highest jackpot in PCSO history? Bong Quintero, who works as a janitor for a condominium, placed his bet at an outlet in Barangay La Paz in Makati. For a chance of a better life, 34-year old Ronnie Daloso and Butch Reyes, a middle manager for a company in Makati, were among other bettors who placed their bets at the same lotto outlet. “Well, it’s a game of chance, swerte na lang kung manalo ka (you’re lucky if you win), the chance is one over 40 million, di ba? So, nagbabakasakali ka, and I guess everyone nagbabakasakali (So you take a chance, and I guess everyone is taking a chance),” he said. Meanwhile, retired factory worker Imelda Ong queued, amid the heat, at another lotto station in PRC in Makati, hoping to bag the jackpot. If she wins, she said part of the money will be given to orphanages and repairs for her mother’s resting place. Larry Bernabe, who moved from Iloilo 26 years ago to Makati and currently works as a messenger, also joined thousands of other lotto hopefuls. Another one who tried his luck was Joey Dominquez, a 23-year-old contractual worker for a fast-food chain.